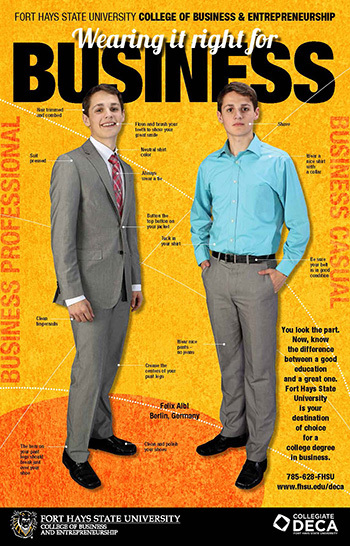 HAYS, Kan. -- Professional dress is not frequently taught in high school, which often leaves graduating students lost in how to properly dress and prepare for interviews or the professional work place. Felix Albl, a senior from Lansing who is the president of the DECA chapter at Fort Hays State University, decided to do something about it. Albl said he thought about what would work best to engage students and teachers, "instead of using the typical stuff that is sent to high schools such as pencils and pens or anything that can be easily thrown around and forgotten." After some serious thinking, they hit on the idea of posters. They decided the posters would showcase students demonstrating how to properly dress for an interview. "We wanted to showcase a variety of students from different ethnic groups that would allow students from different minorities to identify with the students on the posters and feel like they can also succeed," said Albl. To get started, Albl had to figure out where the funding for the project was going to come from. Once they had funding, they started with a photo shoot where six students of different ethnicities modeled clothes that were both business casual and professional. The project officially began in December 2014, with the first and most challenging step making and hand packing the posters. They were sent and received by high schools over the 2015 winter break. Each package also included a letter to the teacher on what the posters were meant to be and the challenge on how to use the posters in different ways or display them with the hashtag fhsubizdress that would be used to post the pictures on Twitter. The winner of the challenge will receive an FHSU-themed prize. Lauren Solzman, a senior from Highlands Ranch, Colo., was one of the students who modeled for the posters. She said she really enjoyed the experience of making the business dress posters. "When we first started the process, I wasn't sure exactly what it was going to entail, but once we got started I saw the vision coming together," said Solzman, "It was nice to see businesses in the community as well as the College of Business working together to complete this project." Solzman also said she wished there had been examples like the posters to look at when she was in high school. "I'm glad that we're able to give this to students to help them understand business attire a little better," she said.